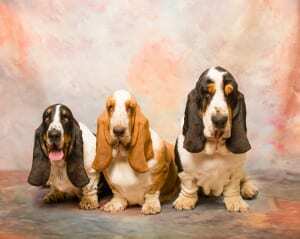 Our European basset hounds are a personal passion of mine. I have very much enjoyed the process of researching the European lines,pedigrees and hand picking the basset hounds that I own. I am looking forward to my first European litter in 2014 , and could not be more excited. Blending these fantastic bloodlines will result in some amazing and beautiful basset hounds of show quality, as well as awesome family pets. My European basset hounds have come from the very best kennels here and abroad. These breeders are all active and extremely successful in show. My “Hubert” is from Queens Hermelin kennel in the Czech Republic . My “Istrie” is from The Gloomy Clown kennel in the Czech Republic, and my beautiful “Layla” is from Corkeys (Home of American and European Champion lines), here in the states. Layla’s sire “Dark Duke” and sister “Meadow” are actively working on getting a champion title now. (congratulations to nancy Corkey)!! .My “precious” is also with European lines from Queens Hermelin.